Legendary Detroit Tigers first baseman who won the AL MVP award in 1935 and 1940. 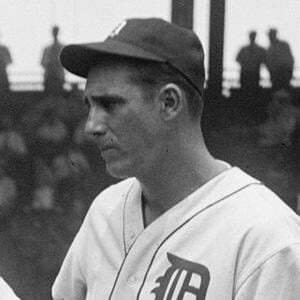 He was a 5-time All-Star and he helped lead the Tigers to World Series Championships in 1935 and 1940. He turned down an offer to play with the New York Yankees and instead attended New York University. He became the first Jewish player to be inducted into the National Baseball Hall of Fame in 1956. After divorcing Caral Lebworth, he married Mary Jo Tarola, who remained with him until his death. He had two sons, Glenn and Stephen, and a daughter, Alva. Al Kaline and Hank Greenberg are considered to be two of the greatest Detroit Tigers players ever.